The elusiveness of all kinds of happiness is common knowledge, for have we not the saying, “Those who search for happiness never find it”? This is especially true of that complete kind of happiness which does not depend on external events, which belongs to the very nature of the individual and remains unaffected by suffering. It persists through both joy and sorrow, being a spiritual undertone which results from the positive and wholehearted acceptance of life in all its aspects. This acceptance, known under many names in the psychology of religion, comes to pass when the individual, the ego, surrenders the conceit of personal freedom and power, realizing that it depends absolutely on that inner, unknown universe which is nature in the human soul. It only exists as an ego to fulfill the purpose of that universe—a purpose which, in one sense, it cannot help serving, but which, in another sense, it does not appreciate when laboring under the conceit of personal freedom and self-sufficiency. When, however, that conceit is abandoned an altogether new and more powerful freedom is known—the freedom of union or harmony between man and life. But “freedom,” “union,” “harmony,” “life”—these are vague terms, and the things they signify seem to be as elusive as the terms are vague. To them also applies the old truism that those who search for them do not find them. Such ideas are the commonplaces of popular philosophy and psychology, but in this instance the commonplace is but the familiar entrance to a largely unknown and labyrinthine territory of the spirit. Less than a hair’s breadth divides the self-evident from the subtle, and the danger is that in ignoring something that lies right at our feet we may trip over it through overmuch concentration upon remote parts of the horizon or the heavens. The very saying, “Those who search for happiness never find it,” raises a host of complications for it will be asked, “If happiness is not found by searching, how is it found?” to which might be added, “If happiness is found by not-searching, or by searching for something else, is not this merely an indirect way of searching for happiness, as it were by a trick or deceit? Surely the important thing is not the means employed, direct or indirect, but the motive for employing them.” There is still another preliminary question that might be asked on this point: “Would it not be true to say that one who does not search for happiness, either directly or indirectly, already has it? Therefore does not the saying that those who search for it do not find it amount to this: those who have it do not search for it; those who do not have it search for it, and thus cannot find it?” In other words, happiness is something which you either have or haven’t, and if you haven’t there is nothing you can do about it except wait for the Grace of God which is something quite outside your control. Whatever the precise answers to these questions it is generally agreed that happiness cannot be had by any form of direct striving. Like your shadow, the more you chase it, the more it runs away. It is not surprising therefore that in both ancient religions and modern psychology man is advised to relax his self-assertive efforts and acquire a certain passivity of soul, encouraging thereby a state of receptivity or acceptance, which Christianity would describe as easing up the tumult of self-will in order that it may give place to the will of God. It is as if man were to empty his soul in order that the gifts of the spirit might pour in, on the principle that nature abhors a vacuum. But whether it is called the giving up of self, submitting to the will of God, accepting life, releasing the tension of striving for happiness or letting oneself go with the stream of life, the essential principle is one of relaxation. “Relaxation” is a word often heard nowadays—advertisers; teachers of dancing, music, swimming, physical culture, riding, drama, and business efficiency; doctors; psychologists; and preachers all use it in their varying subjects, its popularity being increased by the nervous tension of modern life. It may be used to mean anything from reading a mystery story or the secret of a ballerina’s art to the way of life of a sage whose soul is in perfect harmony with the universe. For, like “happiness,” it is a word of many meanings and is used quite as casually, and this is not the only similarity between the two. Relaxation is something just as elusive as happiness; it is something which no amount of self-assertive striving can obtain, for as it is in a certain sense the absence of effort, any effort to achieve it is self-defeating. In an altogether odd and apparently mysterious way the whole question of happiness in this sense is far from straight-forward. It is unusually complicated because in fact it is unusually simple; its solution lies so close to us and is so self-evident that we have the greatest difficulty in seeing it, and we must complicate it in order to bring it into focus and be able to discuss it at all. This may seem a terrible paradox, but it is said that a paradox is only a truth standing on its head to attract attention. For there are certain truths which have to be stood on their heads before they can be noticed at all; in the ordinary way they are so simple that we fail to perceive them. Our own faces are an example of this. Nothing could be more obvious and self-evident than a man’s own face; but oddly enough he cannot see it at all unless he introduces the complication of a mirror, which shows it to him reversed. The image he sees is his face and yet is not his face, and this is a form of paradox. And here is the reason for all our vagueness and uncertainty concerning the things of the spirit, for if our eyes cannot see themselves, how much less can that something which looks through the eyes see itself. It is so clear that it takes long to see. Is the fire in your own lantern. And that your rice has been cooked from the very beginning. 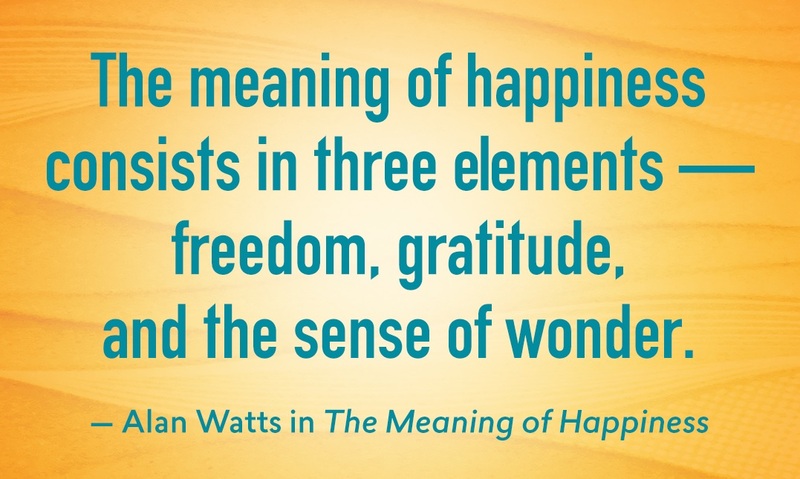 Excerpted from the book The Meaning of Happiness: The Quest for Freedom of the Spirit in Modern Psychology and the Wisdom of the East. Copyright ©2018 by Joan Watts and Anne Watts. Printed with permission from New World Library.